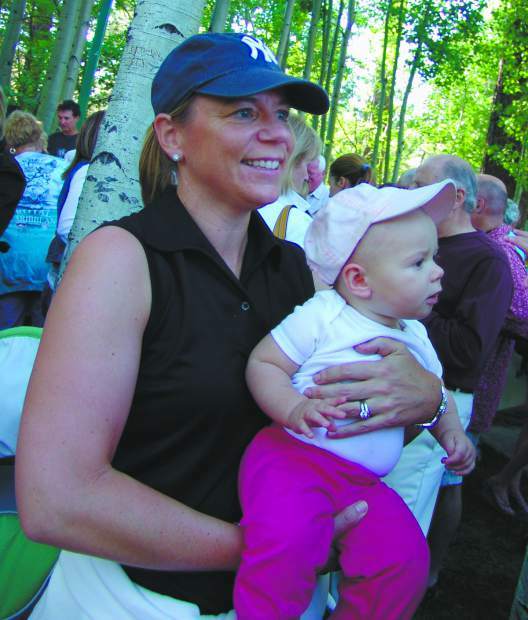 Annika Sorenstam, with her daughter Ava McGee in 2010, will be on hand Saturday for a two-hour youth golf clinic at Tahoe City Golf Course. One of the greatest female golfers in the sports history will join the Tahoe City Golf Course on Saturday, Aug. 18, for a free, two-hour youth golf clinic. Annika Sorenstam will swing by the oldest golf course in Lake Tahoe for a free demonstration geared toward junior golfers as part of the summer-long centennial celebration at Tahoe City Golf Course. “The world’s most famous woman golfer is going to give a clinic right out there,” said course manager Bob Bonino earlier in the year. Ahead of this weekend’s event, Bonino said he’s expecting a few hundred golfers to attend the clinic. Children will be seated up front with adults in the back as Sorenstam gives a roughly hour-long demonstration. The clubhouse recommends attendees arrive around 9:30 a.m. with the clinic beginning at 10. Following the demonstration, Sorenstam will host a meet and greet. Leading up to this weekend’s clinic, Sorenstam and her family were playing a round at the Incline Village Mountain Golf Course. The group was on the 135-yard, par-3 seventh hole last Sunday, according to the clubhouse, and Sorenstam’s husband Mike McGee hit a hole-in-one using a pitching wedge. It was reportedly McGee’s second hole-in-one in his 35 years of playing. Following Saturday’s clinic at Tahoe City Golf Course will be a nine-hole scramble tournament. Cost for adults to play is $50 and children under 13 are free. Space is limited for the tournament, according to Bonino, with only a few openings remaining as of Thursday, Aug. 16. To register, call the course at (530) 583-1516. The course will also continue its 100-year celebration with lady’s rounds every Tuesday for $19.18, along with rounds of $19.18 for any player on Thursdays.